Moisture (max) 94.90%, crude protein (min) 0.44%, crude fat (min) 0.22%, crude fiber (min) 1.12%, ash (max) 5.56%. 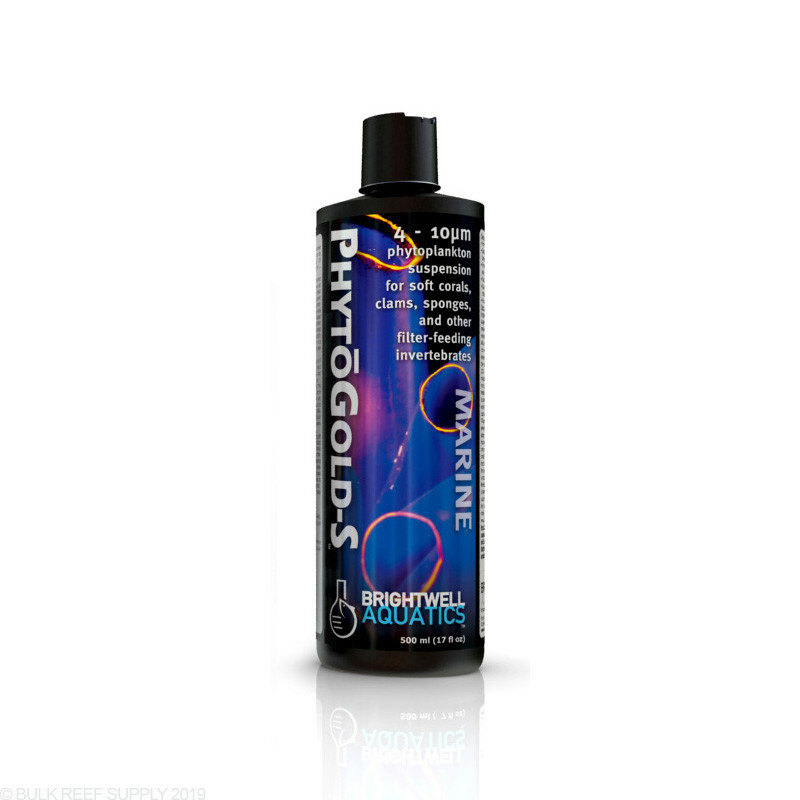 Brightwell Aquatics PhytōGold-S is a concentrated suspension of Isochrysis sp. and Pavlova sp., unicellular marine algae ranging in size from 4 - 10µm and providing the three omega-3 fatty acids EPA, DHA, and ARA; both species of phytoplankton are particularly rich in the omega-3 fatty acid DHA, as well as in several important amino acids. These algae fall within the size class of plankton known as nanoplankton (2.0 - 20.0µm), which is sometimes considered microplankton. They are the proper size for feeding many species of soft corals (particularly those with short tentacles), as well as clams and other bivalves, sponges, tunicates (sea squirts), plumed worms (Christmas tree worms, feather dusters, etc. ), and larval invertebrates such as those of many bivalves. Though Isochrysis and Pavlova provide a number of amino acids, one that is not naturally present has been added to PhytōGold-S; this proprietary amino acid has been shown in studies to increase coloration of corals and other marine invertebrates. Additionally, a small percentage of vitamin-C is present to increase the benefits of PhytōGold-S, particularly to corals and their allies that have recently undergone fragmenting or propagation. PhytōGold-S may be used in conjunction with other planktonic suspensions to provide a complete range of sizes to filter-feeding and planktivorous organisms. PhytōGold-S does not require refrigeration, however storage in a cool, shaded area will prolong the activity of the vitamins. Refrigeration will maximize the shelf-life of the product.